One of the great mysteries of comics is the fact that Image's 'Tokyo Ghost' isn't more popular. It has some of the best talents in the industry in writer Rick Remender, penciler Sean Murphy, and colorist Matt Hollingsworth, all at the top of their professions. A futuristic cautionary tale about our addiction to digital media told through a rousing and bloody revenge fantasy. What more could you want? Debbie deserves her revenge and now as the "Tokyo Ghost" she's one step closer as she faces off with the architect of her despair, Davey Trauma. It won't be easy as Trauma is ready and has the brainwashed, content-feed addict, love of her life Constable Led Dent under his control. The showdown doesn't disappoint but Remender provides layers and layers of subtext to seeing Debbie and Led go at it. It's both heartwrenching and visually stunning. The flashback to when they were kids is both charming and kind of sad but binds the two characters and adds pathos to the issue. Trauma tries to get in Debbie's head, blaming her for what happened in Tokyo. This becomes a difficult sequence of events as Trauma paints her as the cause of all the destruction that occurred when it was really him that sabotaged the idyllic gardens of Tokyo. It's about victim-blaming, being co-dependent to someone like Led aka Teddy, who has a serious addiction problem. She contends throughout she does it for love and in a world as hellish, cruel, and withdrawn as the one depicted I can't blame her for trying to hold on to her one source of happiness in her life. It speaks to the heart of loving someone with addiction. Even with these heavy themes Remender keeps the pace swift and action-packed with devasting consequences at the end. Murphy and Hollingsworth as usual, put on a master class of sequential art with fight scenes that are as fluid or better than most films. The layouts are clear and electric with color work that highlights the combatants, focusing your attention on them and the little details that come across without a single word of dialogue needed. You're not going to find a better art duo in comics. 'Tokyo Ghost' is the best comic you're not reading. It has some of the best work from Remender, Murphy, and Hollingsworth. The emotional gut-punch in this issue mixed with incredible action is why this series deserves more eyeballs. 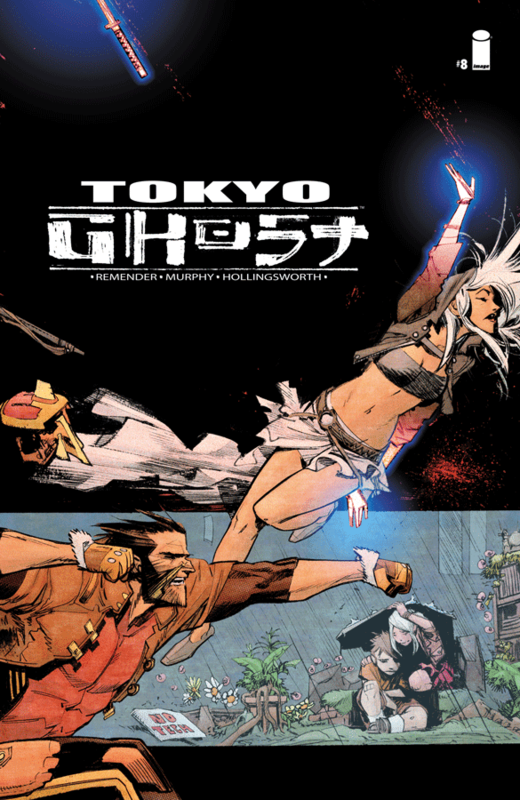 This is just the latest round of dynamic storytelling that makes 'Tokyo Ghost' a must-buy for serious comic book fans.